The prototyping area provides blocks for connecting the address and data lines, and ports PA, PB, PC, PD, PE, PF, PG, PH, PI and 3.3VDC and ground. A block for ADC1, ADC2 and ADC3 signal input to the additional A-to-D capability of the LIS3DH MEMS motion sensor(IC26). 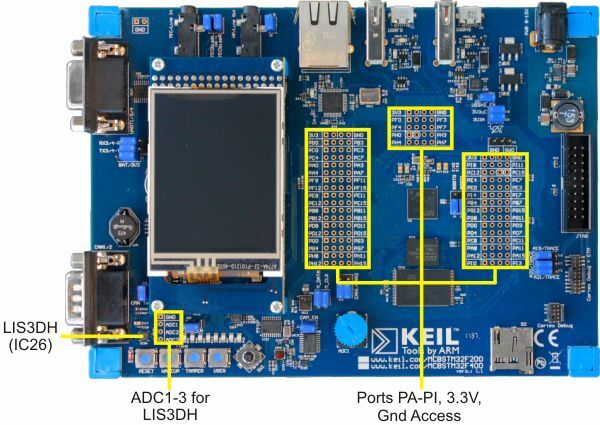 When modifying this board, check the schematic diagram to see which pins are currently being used by on-board peripherals. Be aware that the port pins on this device have multiple functions. Make sure you check the pin function assignments in the reference manual for your device when using the port pins in the prototyping area.